Finding a reputable, certified mold removal and mold inspection company in Gibbsboro, NJ can quickly become an overwhelming task. At MasterTech, our team understands and appreciates your concerns and promises to live up to – and exceed your expectations. For years, MasterTech has been committed, and will continue to be committed to providing New Jersey families and businesses with the safest and most effective NJ mold removal services. Our specially trained team of technicians are meticulously trained to be sensitive to your needs and concerns. MasterTech technicians are fully equipped with the appropriate tools and training to confidently removal your mold safely and effectively. As proof of our commitment to you, your family, and your business, each mold remediation in Gibbsboro, NJ is backed with a 5-year mold-free warranty. Our team of experts used years industry experience and research to develop a Camden County, NJ mold removal process that is second to none. Detecting signs of, potentially serious, mold development can place a lot of stress on Gibbsboro, NJ home and business owners. Worries about family health and safety, loss of property value and mold cleanup costs can be quite the burden. No matter how extensive the mold problem, Mastertech’s guaranteed Gibbsboro, NJ mold removal methods will restore your property safely while maintaining its value. MasterTech’s top-notch Gibbsboro, NJ mold remediation and mold removal process integrates the safest, most efficient, most effective, and most advance mold removal techniques available in the industry today. As science evolves and discovers new approaches to handling mold, our team of experts are constantly testing new methods and adopting new techniques that can further improve our procedures for even better results. Gibbsboro NJ home and business owners are often under the false impression that a property needs to experience of flood of there to be a major mold problem. Unsuspecting elements like humidity, condensation and poor air circulation cause and sustain mold growth more often than flooding or water leaks. Since most of your basement foundation walls are underground, they tend to seep or leak moisture through tiny pores and cracks. Most Gibbsboro, NJ basements are constructed of cinder block, poured concrete or rubble walls, and unless they’ve been properly waterproofed – they will eventually leak. The first sign of seepage through your basement walls is usually water staining or efflorescence. Efflorescence is the white, powdery substance that develops on the foundation wall surface. It is often mistaken for mold spore. Efflorescence is not mold. In actuality, it is salt and mineral deposits left behind by the water seeping through the walls. If unaddressed, that is an adequate water source for mold to flourish. If you suspect mold or have a damp conditions and a musty odor in your basement, call a professional to appropriately address the problems. Most crawl spaces are the ideal breeding ground mold. The often dank conditions will allow mold the opportunity to thrive. Porous building materials and poor building envelope design play a huge role in most crawl space mold in Gibbsboro, NJ. Many crawl spaces are poorly vented with undersized wall vents, making moisture and mold issues worse. In spring and summer, crawl space vents introduce warm air into cool crawl spaces causing condensation on wood and masonry building materials. The same effect happens during cold seasons – only in the opposite order. The combination of heat and poor ventilation can cause Gibbsboro NJ attic mold. If not properly ventilated, moist air gets trapped and infuses itself into the attic sheathing and rafters. This moist air can also increase airborne mold spore levels which can settle into insulation and on belongings stored in your attic. Proper mold remediation techniques are important to ensure that attic mold doesn’t cross-contaminate the inhabitable areas below during cleanup. Our process also minimizes or eliminates dark staining left behind by moisture. Call today 1 (800) 310-3226 for your Gibbsboro NJ attic mold removal estimate. Most mold contamination in interior spaces is caused by water leaks, flooring or broken pipes. However, issues as seemingly minor as, humidity can create an adequate water source for mold. Mold does not need much to thrive: a water source, organic matter to break down, and comfortable temperatures. 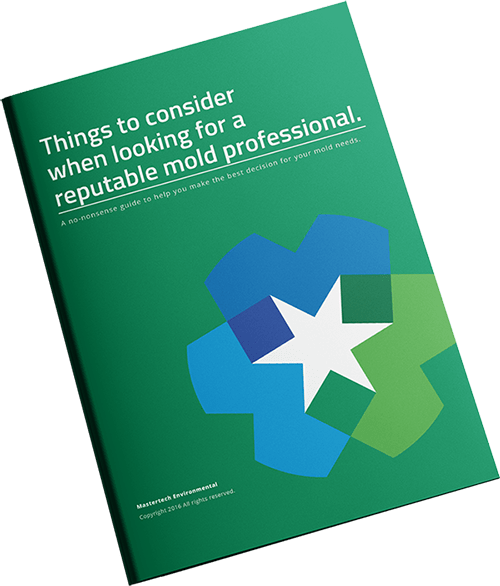 Standard indoor temperatures are plenty warm for mold, and all that cellulose-based building materials offer a buffet that mold is just waiting to feast on. The only element preventing indoor mold development is sufficient water source. If you suspect that you are sharing your home with mold, call a mold professional today to have your property assessed. Mold is not always obvious, and the signs are not always so clear-cut. A Gibbsboro NJ mold inspection will help to promptly diagnose your problem and determine why they began in the first place. MasterTech Mold Inspectors are thoroughly trained and properly certified to perform mold inspections and testing throughout New Jersey. Moisture is the main culprit in any mold case. Each of our mold inspectors are equipped with moisture meters and thermal imaging cameras to find moisture sources that can cause mold. Resolving the moisture source will prevent recurrence. Mastertech provides mold testing for Gibbsboro, NJ homes and businesses. Our inspectors are trained to collect air or surface samples to gather scientific evidence and support of the presence of fungal activity. All samples gathered are sent off to a third party lab for scientific analysis. Once we define the mold species and levels of airborne mold spores, we will be able to use that information to help determine if your health or property is at risk. In addition, your inspector will be able utilize the data to gain a further, more clear understanding of the problem at hand to properly develop a plan of action. Your inspector will be able to produce a detailed scope of work that is appropriate for your specific mold needs. If you suspect a mold problem in your residential or commercial NJ home, call MasterTech Environmental to schedule an appointment for a Camden County, NJ mold inspection. For mold removal in Atco, NJ or mold inspection in Barrington, NJ call us today. Our mold inspection and mold removal specialists are standing by to answer all your questions and schedule you for an appointment.